This "ishtoo" is typical to Syrian Christian homes in Kerala and I try to make this with Appam whenever family visits, especially for breakfast at Easter or Christmas.Stew with crispy lacey Palappams is an integral part of family gatherings and most definitely on special occasions. It is quite simple to prepare with coconut milk being easily available in tins but incredibly tasty especially if you like coconut milk based curries. Now if you want the spicier yellow coloured stew like my mother in law makes, add and lightly fry the garlic, and then the spices mentioned - coriander, turmeric and garam masala and saute just until till spices no longer smell raw. For added flavour you can fry curry leaves and 2 small onions till brown in 1 tbsp ghee/ coconut oil and pour on top. * - You can choose to leave out the chicken or mutton to make a vegetable stew. Stew is traditionally served with Appams or Idiappams but it is also great served with soft warm bread rolls or rice too. Looks so good..I am going to try a Veggie version of the same!! Do let me know how it turns out! 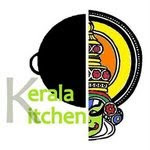 And don't forget to send it in to Kerala Kitchen! Thanks so much for trying it Divya, your pictures are beautiful!